The Dow is at a 5 year high. We are still in a recession, or at the very least a period of minimal growth. Government deficits and debts are high than ever. Oh wait, that last point, I think I just answered my question. Never mind. The reason we are at record levels on the stock market is because the government is printing money like crazy, so there is lots of money floating around out there. But, because of these massive deficits, the government has to keep interest rates artificially low, or else the borrowing costs would be a killer. So there is lots of money out there, but no where to invest it, because you can’t earn a return on bonds, or in a bank account. So you invest in the stock market. So the stock market goes up. Is it that simple? Yup. Of course an artificially inflated balloon cannot rise forever. 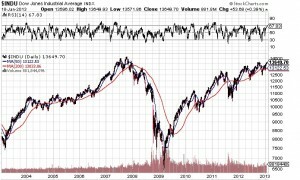 As the chart shows the RSI is now approaching 70, which is overbought territory. A correction could be on the way. Or not. Who knows. Continued money inflation could keep the balloon aloft for many months to come. You would think that all of this money printing would cause monetary inflation, which would make the price of gold go up, and you would be correct. 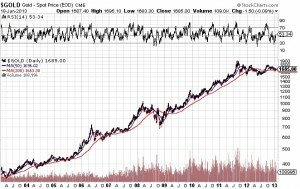 Looking at a chart of the same time period (10 years), the Dow has increased from around 8,000 to 13,650 or about 70%, while gold has increased from around $300 to about $1,700, or over 450%. If all you watch is the stock market you would assume, incorrectly, that all is well. 70% in ten years sounds good, 0% in 5 years sounds less good, but either measure misses the point, because we are measuring, ultimately, in dollars. Inflating a paper dollar does not increase real value, which is why you need to keep an eye on gold. With gold over the long term significantly outperforming paper money, it’s clear where your money should be. (And yes, I understand that gold has not really increased in value. It has maintained it’s value while the paper it is denominated in has decreased, but the concept is the same). So, keep some gold in your pocket, and stand by. See, that was brief and not at all painful.